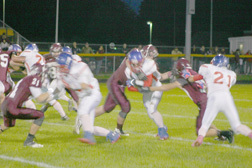 Big wins from local teams Britton Deerfield, Blissfield and Whiteford Friday night guaranteed both the BD Patriots and WHS Bobcats berths in the 2013 high school football playoffs. BD stymied the Morenci Bulldogs, who were also hungry for a playoff bid, 56-21, securing the Patriots’ playoff bid for 2013. 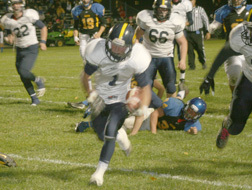 Whiteford also turned in big numbers, with a 42-6 victory over Madison, to assure the Bobcats a playoff appearance. Though Blissfield blanked Onsted 41-0, this will be the first time the Royals haven’t made the playoffs in several years. However, BHS has logged back-to-back wins the last two weeks and won three out of their last four games. There is one more week in the regular season for area teams. For the complete stories on all these games, please pick up an Oct. 23, 2013, edition of The Advance.